Opinion of Notary Depot: Our guess is there will be no real story here. It doesn't seem like Secretary of State Elaine Marshall went out of her way to commission non-citizens as notaries public for political reasons. If there was proof of that, by looking at the numbers under her and her predecessors, it would probably be a big story. Still, this is not a national story, so information is scarce, and anything is possible. But at this point it just sounds like trying to get her on a technicality, which we don't like to see on either side. We would like to see this law clarified though, going forward. Update 4/3/2017: We received a reply from the office of Rep. Chris Millis (North Carolina) regarding our request to cross-check the list of notaries they have found that “did not met the legal requirement to be commissioned as a notary public”. They will be providing us details as soon as they determine what needs to be redacted and what can be made public. 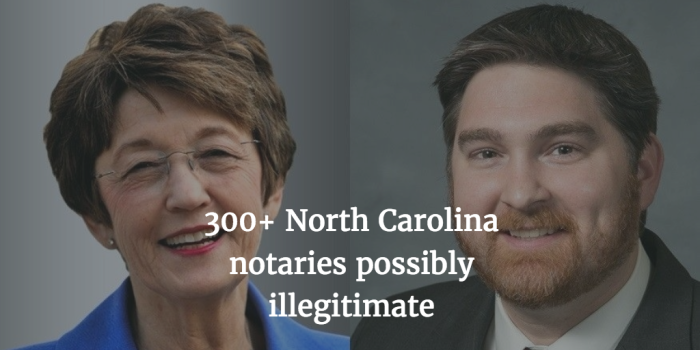 In response to the recent revelation that North Carolina’s Secretary of State allowed over 300 illegal residents to become Notaries Public, Notary Depot has decided to immediately suspend all accounts in North Carolina until we can determine the legal residency status of each notary. While we realize this is an extraordinary step, this revelation is also extraordinary, and we feel it is our duty and in the public interest to do our part in preventing potentially illegitimate notaries from being found online. We’ll begin cross-referencing accounts and reaching out for further proof of legal residency. Our goal is to reinstate legitimate notary accounts as quickly as possible.